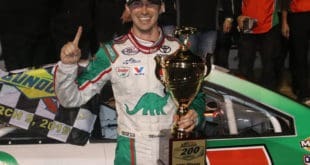 Sunday proved a redemption song for Venturini Motorsports driver Michael Self, who scored the win in the rain-shortened Kentuckiana Ford Dealers 200 at Salem Speedway. Rewinding back to last fall’s Salem race, Self had one of the worst starts in his ARCA career, hitting everything but the pace car in the opening 100 laps of the event before being taken out by Zane Smith. That performance was in the rear view mirror on Sunday. Fresh off a short track win at 5 Flags Speedway last month, Self qualified fourth and by lap 28 took the race lead from polesitter Carson Hocevar, a lead Self would not relinquish until the yellow flag flew on lap 89 for a Ty Gibbs spin. As pit stops cycled, Self would find himself back in the race lead when the event went back green on lap 95, only to be red flagged for good on lap 101 when a rain squall drenched the Salem Speedway. With the ground already heavily saturated (there was standing water visible on the apron in turn 1 for the entirety of Sunday’s race), ARCA officials decided to call the event. The major headline for the weekend came before the race went green on Sunday. 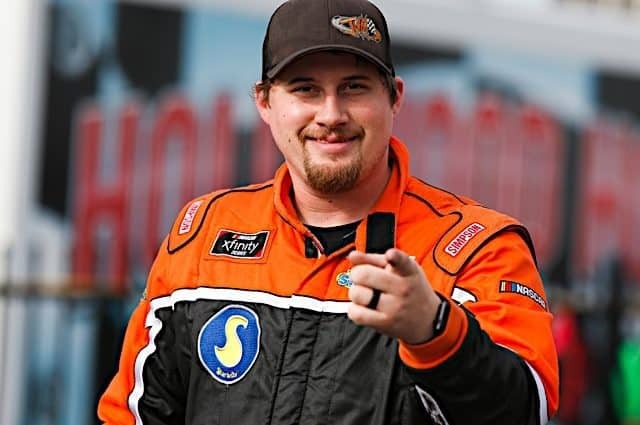 Christian Eckes, the defending Salem spring winner and a title favorite for 2019, was hospitalized over the weekend with flu-like ailments and was unable to start Sunday’s race. Though Harrison Burton filled in for the No. 15 team in terms of securing owner points, Eckes scored no driver points as a result of his illness (more on the point standings later). Self spent the build-up to last month’s race at 5 Flags Speedway describing how he sucked at short track racing. Yet, in the months since ARCA left the Daytona International Speedway, Self has scored consecutive wins…on short tracks. And unlike at 5 Flags, where Self capitalized on Raphael Lessard’s late race fade, Self proved untouchable up front after he cleared Hocevar, even with short-track ace Chandler Smith running in the top five. Coupled with Eckes’ ailments, Self and Venturini Motorsports’ flagship No. 25 are back at the top of the ARCA Racing Series heap. (Side note: it was cool to see was Self getting choked up wishing his teammate Eckes well in trackside remarks following ARCA’s call of the race. Very classy). 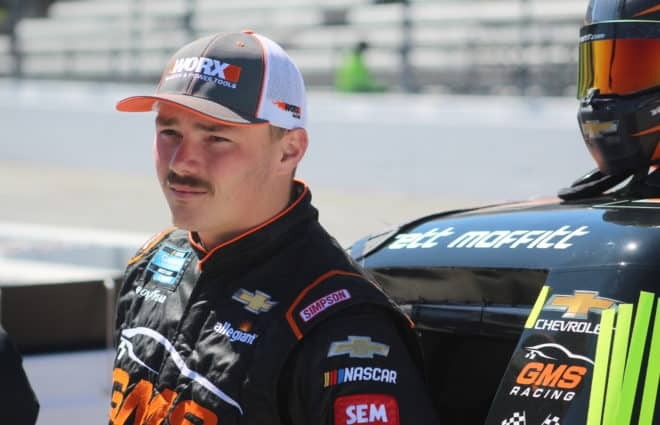 Sam Mayer made more progress through the front of the field than any other driver on Sunday, with the GMS Racing prospect ending the event in the runner-up position, a career-best finish for the teenager. 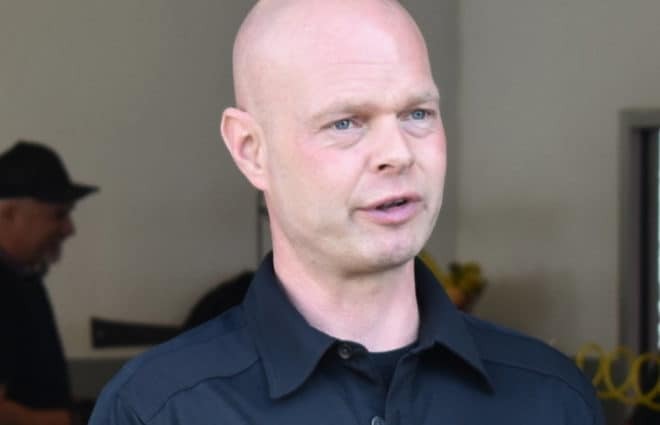 Mayer was visibly frustrated in his post-race interview with ARCA’s decision to call the race early, as the team was confident their car could challenge Self had the event gone green. 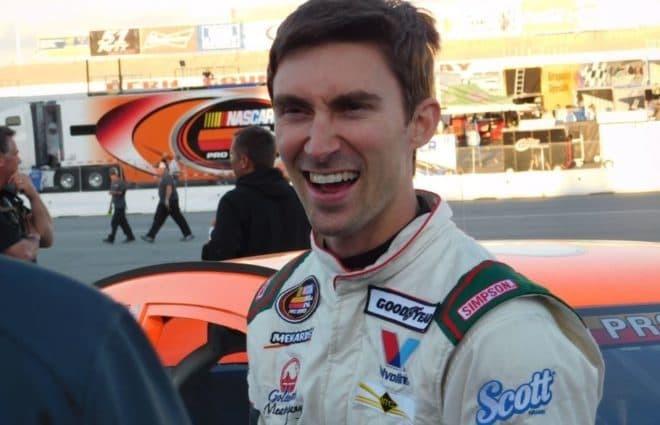 For now though, GMS’ venture back into ARCA racing seems to have found its footing. Hocevar’s weekend resulted in his second career ARCA pole and a career-best third-place finish. Corey Heim’s fifth place result was tops for the Chad Bryant Racing operation for the second consecutive race and equaled his career best finish. By lap 35 the No. 27 was outside the top 10 with significant damage to the right front corner after contact with the outside wall. At day’s end, a 12th place finish wasn’t a disaster, but proving a non-factor seven laps off the pace was. After winning at Lucas Oil Raceway in his first career ARCA start in 2015, Braden has gone 31 starts without returning to victory lane. 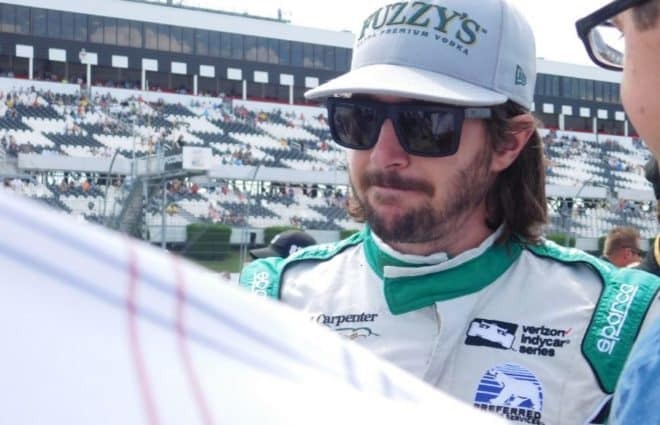 Burton got the phone call at 11:30 Saturday night to fly to Salem to substitute drive for the ill Eckes, certainly not a desirable set of circumstances for any race car driver. But the fact that the 2019 ARCA winner at Daytona and Truck Series regular was only able to work Venturini’s powerhouse No. 15 car up to eighth in 101 laps of competition can only be considered a shortcoming. Burton visibly lost the tail end of the lead pack coming up to speed on lap 1 after having to start at the rear of the field, and admitted during the rain delay that he had burned up his right front tire working traffic in the first half of the event. Burton was put in a tough spot, but in a Salem field that included only 18 cars (the lowest car count seen for an ARCA race at the track in more than 30 years) more can and should be expected. Ended up P10 today @BMSupdates . I screwed us on first lap. Really proud of everyone @DGR_Crosley we had a fast car all weekend. Let’s be clear, the “bad” here is not in any way shape or form reflective of Chandler Smith’s performance behind the wheel. In finishing fourth, Smith has now scored top 10 finishes in 11 consecutive starts in ARCA competition. Smith was also showing mastery of tire management on the abrasive Salem surface, as he worked from seventh to second prior to the red flag and was picking off cars in the top five over the final 30 laps of the event. But the No. 20 team went from making a race-winning pit strategy call to giving up a sure trophy in the span of less than five laps; Smith initially stayed out when Self and the lead lap cars pit under the lap 89 yellow, only to dive down on pit road right before the lap 95 green to take tires. Given how dark the skies surrounding Salem Speedway were immediately before going green on lap 95, there’s reason to question the pit call. It’s already damaging enough to miss a race start when the ARCA Racing Series season is only 20 races long. It’s more damaging when the missed race start comes at Salem, a track that Eckes won at one year ago. Eckes is losing 210 points due to Self winning Sunday’s race. Awarding such points makes ARCA’s title hunt very different from those at NASCAR’s top level, and there’s good reason for it…given the number of drivers that make spot starts in ARCA competition, especially on superspeedways, it has over the years proven beneficial for ARCA to offer incentives for their race teams to contest all events. Given the struggles the ARCA Racing Series has had with car counts since last season, it makes even more sense now. But for Eckes, winning a championship in 2019 has become a truly monumental task. Not only will Eckes have to win races in bunches, he will need Self to run into trouble, and for the fields of cars to grow. If many of the 2019 ARCA races play out like Salem, where a finish towards the back of the top 10 is considered mediocre, there’s not going to be a lot of room for Eckes to gain points on Self. Following Salem, Braden leads Self by five points in the season standings, with Bret Holmes 20 markers back. Eckes falls to eighth in points, 105 behind Braden. 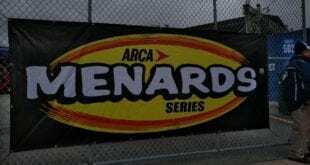 The rain in Indiana on Sunday definitely put ARCA between a rock and a hard place. Even though the rainfall that ended Sunday’s race was over in less than 15 minutes, the racing surface was definitely lost, and the grounds already saturated (the puddles on the low side of turn 1 were standing the entirety of the event). Given that Salem does not have jet drying equipment available, restarting the event was going to take considerable time and effort. What’s more, the cooler temperatures and threatening skies obviously had taken a major hit already on the crowd, which was the smallest seen for an ARCA race at Salem in recent memory. In terms of a “show must go on” argument, the fact that ARCA got the speedway race ready and got 101 laps in was an accomplishment in itself. Dude. Today was a joke. Rains for 15 minutes then sun comes out and wind is blowing let’s call it!